We’re bringing you another Tuscan classic made our way at Due’. 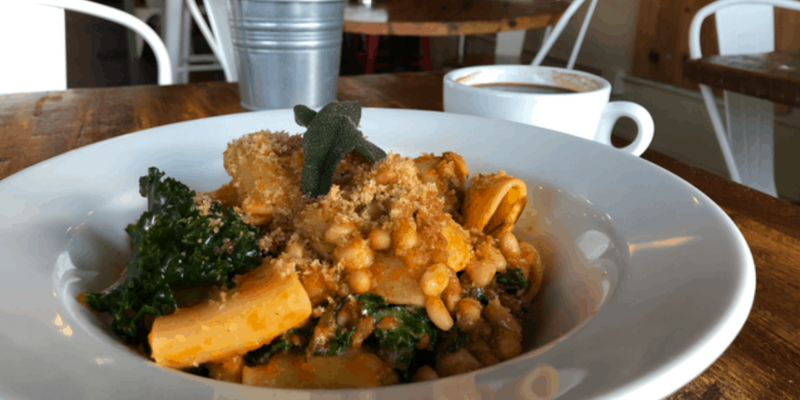 Look out this week as we add Vegan Bean Ragout to our menu. With our new Vegan Bean Ragout, we’ve created our own, modern version of the authentic Italian dish Pasta & Fagioli. In the United States, you know this dish as “Pasta Fasul” as well, derived from the traditional name. Though you’re likely familiar with this pasta and bean dish, it has a long standing history in Italy. It’s arguably the “national” dish of Italy in the sense that every region honors and has its own rendition of this favorite. This dish is said to be originally from the Campania part of Italy and, as many Italian classics, began as a ‘Cucina Povera’ or food of the poor. It’s simple ingredients reflect this but it’s rich flavors ensured this dish one served across Italy and the world for generations. It’s one of the best expressions of this Italian culinary heritage. For the base of our ragout, we use a rich blend of Heirloom black valentines beans, Navy beans, and Garbanzo beans. At Due’, we’ve modernized the dish with the use of sourdough breadcrumbs and crispy aromatic herbs. We also pay even further homage to Tuscany by adding black cabbage, as a nod to Tuscanian cabbage soup “Ribollita”. This adds a hearty, veggie-base that is perfect for a warm winter meal. This dish is by nature vegetarian but you can request we make it vegan for you! If none of that appeal to you and you’re a meat eater, we can also add in homemade pork sausage for a rich, hearty meal. Pair this dish with a glass of Chianti and you have the ultimate Tuscanian experience. Come in and try our version of this all-Italian classic this week!